What it’s about: Only the best elementary school band of all time. 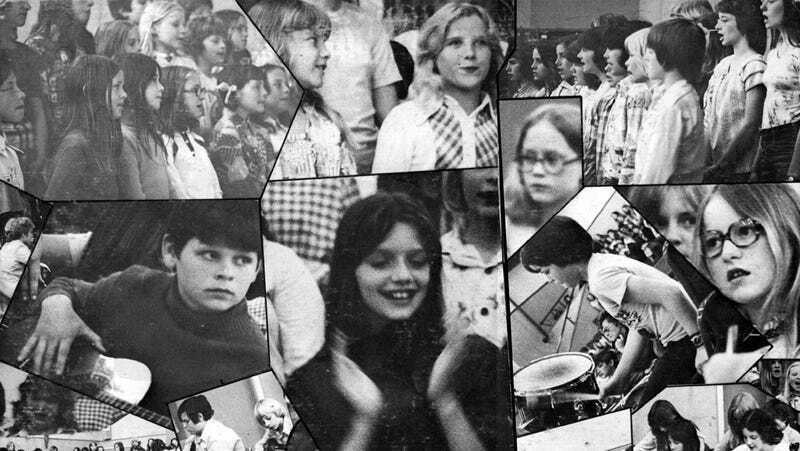 In 1976, while their peers were wheezing through “Hot Cross Buns” on the recorder, children in British Columbia’s Langley School District were playing surprisingly affecting covers of FM radio hits, thanks to their unorthodox music teacher. Strangest fact: Fenger’s recordings of the Langley kids were a critical smash… 25 years after the fact. He released small runs of two EPs, with the catchy titles of Lochiel, Glenwood, And South Carvolth Schools (1976), and Hans Fenger/Wix-Brown Elementary School (1977). Copies were presumably given out to the students’ families, but the albums never got any proper release. Decades passed, and in 2000, a record collector in Victoria, Canada found Lochiel in a used bin and sent it to outsider music expert Irwin Chusid. Chusid immediately began working on giving the music a wider release. Thing we were happiest to learn: The kids were really good. True, the songs are undeniably amateurish—out-of-tune guitars, some flat vocals, the occasional missed cue. But Fenger put more thought into his arrangements than a thousand bar band cover songs. “Space Oddity” is played on guitar and marching band percussion, but adds xylophone, a pick scraping down a guitar string, and an unidentified shimmering sound that’s appropriately otherworldly. “God Only Knows” starts as a choral arrangement, with bells punctuating each line, until guitar stealthily creeps in behind the kids. “Rhiannon” starts with wood block percussion and xylophone. Fenger was ambitious enough to aim high with his material, leading the kids through complicated numbers like “Band On the Run” and “Good Vibrations.” And while the recordings are steeped in childhood melancholy, an occasional tune like “Help Me, Rhonda” bursts through, full of the kids’ unbridled exuberance. Best link to elsewhere on Wikipedia: We’re going to cheat and go two links away. One of the most charming and idiosyncratic acts on the Bar/None roster is the (now defunct) Trachtenburg Family Slideshow Players. Jason Trachtenburg was a frustrated singer-songwriter, when his wife, Tina Piña, bought a slide projector and a collection of slides sight-unseen at a garage sale. Jason began writing songs about the slides—which ranged from strangers’ family vacations to corporate marketing presentations—and they formed a new band, in which Tina ran the slide projector, Jason played guitar and piano and sang, and their 6-year-old daughter, Rachel, played the drums. They released three albums before disbanding in 2008. The following year Jason and then-16-year-old Rachel each formed new bands, The Pendulum Swings and Supercute!, respectively. Further down the Wormhole: Fenger favored the Beach Boys, which account for seven of the 21 recorded Langley songs. But he cast a wide net, as the covers include Paul McCartney, Fleetwood Mac, Barry Manilow, the Bay City Rollers, and Neil Diamond. The “Jewish Elvis”’ 1969 hit “Sweet Caroline” was sung by the Langley school kids, and has also inexplicably become a fight song for the Boston Red Sox, Carolina Panthers, and various sports at University Of North Carolina and Pitt. While the Sox are most associated with the song, it can be heard at stadiums all over Major League Baseball. We’ll celebrate opening day next week with a look at one of the sport’s biggest and strangest scandals (one we briefly touched on five years ago), the Pittsburgh drug trials.